This is a compact shrub with pure white flowers in spring. Blooms later than most Pieris. 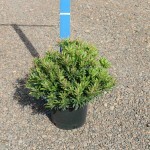 New foliage is bronze, maturing to dark, glossy green. Showy red flower buds are set in summer. Prefers part shade.